Perhaps more importantly, if children learn to love beauty, they will love what is true and good. I found an unfinished wood hanging cross and a small unfinished wood plaque at Michaels. I sawed the slightly curved end off the bottom of the cross using a miter box and a handsaw. Then I screwed them together (I drilled a pilot hole first), and painted them brown (Daniel Smith brand Burnt Umber). 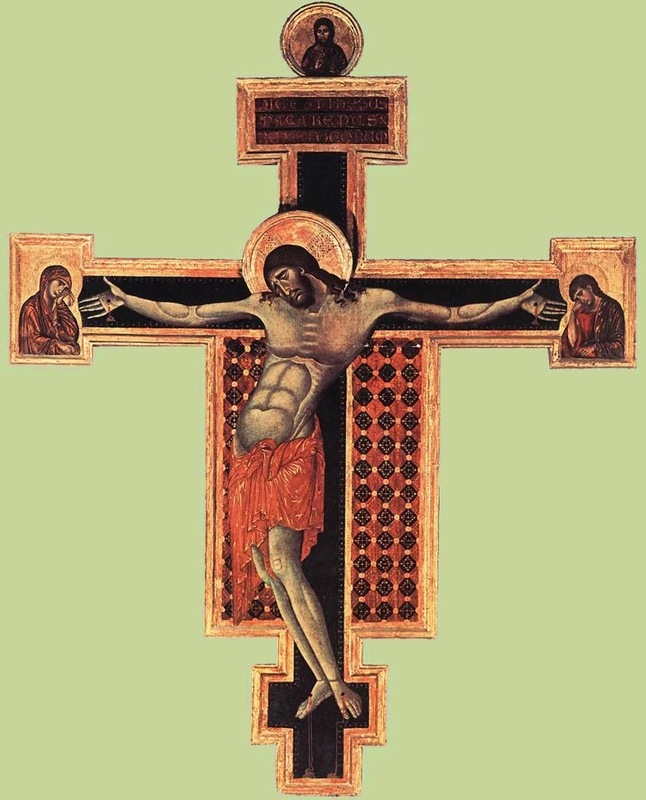 Next I found a suitably beautiful looking piece of art on the web and resized it to fit on the cross. 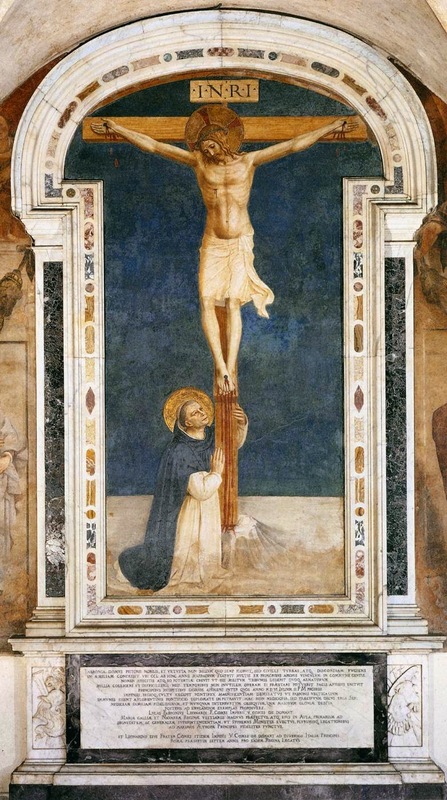 This is from St. Dominic Adoring the Crucifixion by Fra Angelico (left). I printed it on digital photo paper using my plain old inkjet printer, cut out the corpus and the INRI sign and glued them to the cross. I finished the whole thing with 2 coats of acrylic matte medium for a little protection. Now my son J uses it on his "altar" (Ikea dresser) to play Mass. I'll write a post about that another time. My 4-year-old daughter, S, wanted one too of course. 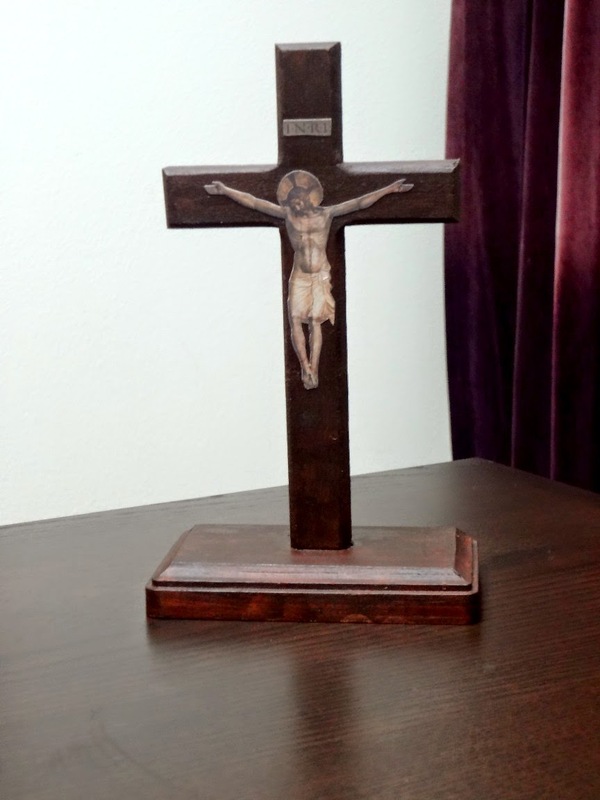 I found this little 4" x 3" wooden standing cross at Hobby Lobby. It has a small inset perfect for gluing art into! 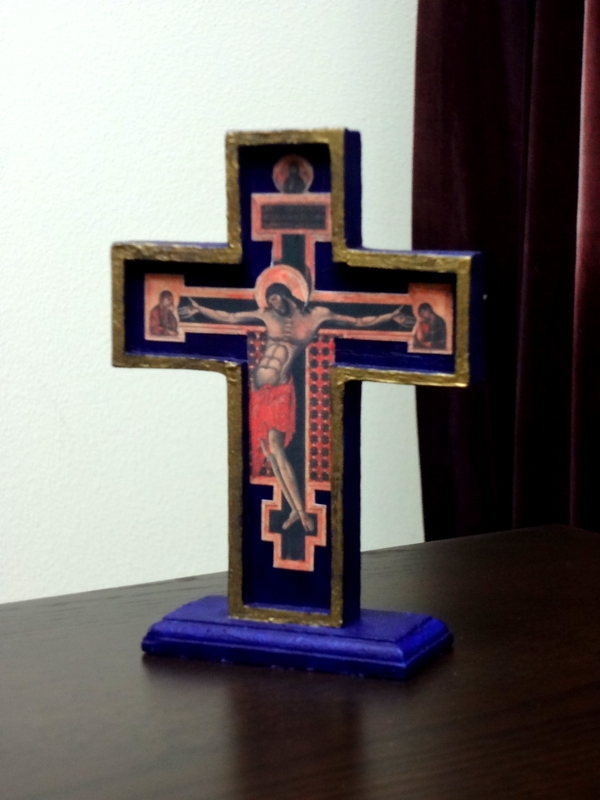 I decided to go with an Italo-Byzantine style crucifix this time. Cimabue painted this one to hang in the Basilica di Santa Croce, Florence. I asked S paint the entire cross Ultramarine Blue. Cimabue's famous pupil, Giotto, was very fond of that color. Like the first project, I re-sized and printed the artwork on digital photo paper, cut it out and let S help me glue it into the inset. Then I painted the edges with gold craft paint (it looks a little better in real life) and finished it all with 2 coats of acrylic matte medium. This sits on her dresser along with a hand-embroidered picture of the Holy Family that her aunt brought her from Egypt.